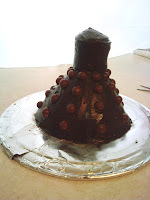 For those of you Dr. Who fans out there, here is the Dalek Cake I made for a friend's birthday party. (For my fellow Americans who haven't yet experienced Dr. Who, Dr. Who is a British sci-fi T.V. show equivalent to Star Trek in the States minus a lot of the "I am Kleptar from the planet Ooptigarn. My ship is damaged and is in need of whobitigoobity and a refractory some scientific word lasar warp engine" and all that mumbo-jumbo. Not that that's bad, I grew up on Star Trek. Live long and prosper. Star Trek's just a little harder for Star Trek outsiders to get into. Dr. Who is a little more mainstream. It's been around forever, but has recently been re-done, and my husband and I are hooked. My little two-year-old can even sing the theme song. Dr. Who keeps getting better and better as time goes on.) I apologize for the bad image quality. These were taken with my phone just after I dropped my other camera. 3. 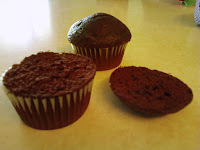 Cut the rounded top off one of the cupcakes. 4. 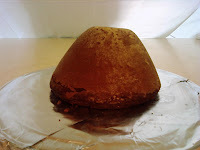 Place cut cupcake on the top of the domed wonder mold cake. Place complete cupcake on top of that. Secure layers together by sticking a bamboo skewer through all three layers. Cut off the excess skewer. 6. Cut about a cup of the malt balls in half. 7. Stick the malt balls on the cake in vertical columns. 8. 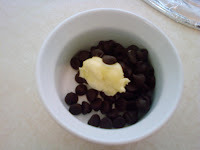 Melt chocolate chips and the tbsp of margarine in the microwave for about 30 seconds or until the chocolate is melted and smooth when mixed. 9. 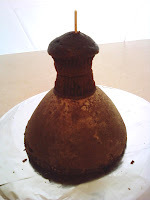 Roll a toothpick in the melted chocolate and stick it into a cut malt ball to create the Dalek's plunger thing. 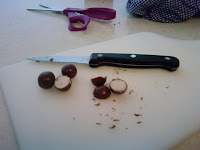 Dip the cut malt ball end into the chocolate and then place onto the waxed paper. 10. 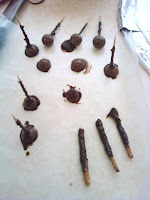 Roll another toothpick in the melted chocolate and stick into a complete malt ball to create the Dalek's "eye." 11. Coat a pretzel stick in chocolate. 12. Stick eyeball, plunger and ray gun into the cake in their appropriate places. 13. Mix more black food coloring into the remaining frosting. 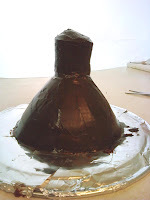 Using this darker frosting and a basket weave decorating tip pipe lines around the top of the Dalek (the cupcake layers). 14. Pipe a scalloped edge along the bottom to clean up the edges. 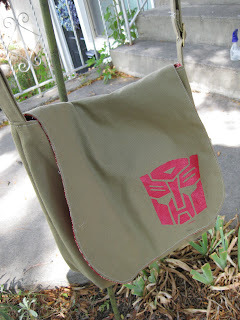 I did this with the basket weave tip as well. Done! 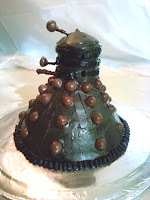 Now you have your own Dalek cake!